Mr. Raymond “Ray” Porter , age 85, of Mocabee Creek Road, Olive Hill, Kentucky, passed away Sunday morning, October 28, 2018, at his residence. He was born May 21, 1933, in Carter County, Kentucky, a son of the late Paul and Arlie Goodan Porter. 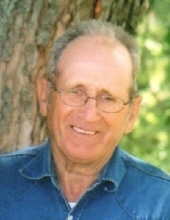 Ray was a member of the Soldier Church of God and was a lifelong farmer, logger, and dozer operator. He enjoyed taking care of his cattle, loafing at Globe Feed Store, the stockyards and spending time on the farm and especially with his daughter. In addition to his parents, he was preceded in death by his wife of 55 years, Janet Caudill Porter, whom he married on September 21, 1957; two brother, Junior Porter and Curt Porter; and three sisters, Wanda Manning, Martha Thomas and Patricia Stamper. Ray is survived by one daughter and son-in-law, Tina Marie Porter Parsons and Roger of Globe, Kentucky; one brother and two sisters-in-law, John Paul Porter and Sue of Lawton, Kentucky, and Phyllis Porter of Olive Hill, Kentucky; three sisters and two brothers-in-law, Sue Dean and Terry, Ella Thompson, Bonnie Thompson and Homer Stamper, all of Olive Hill, Kentucky; and special caregivers, Debra Burchett, Kathleen Purnell, Judy Brewer, Norma Barnett, and Kathy Fraley. He also leaves many other family members and friends who will sadly miss him. Funeral services will be held at 11 a.m. Wednesday, October 31, 2018, at Globe Funeral Chapel in Olive Hill, Kentucky, with Brother J.C. Bond and Brother Bobby Day officiating. Burial will follow in the Olive Hill Memorial Park in Olive Hill, Kentucky. Friends may visit from 6 p.m. to 9 p.m. Tuesday, October 30, 2018, and after 9 a.m. on Wednesday at Globe Funeral Chapel, 17277 West Highway US 60, Olive Hill, Kentucky 41164. Benny Caudill, Rob Puckett, Mark Orcutt, Homer Stamper, Roy D. Porter, Josh Thompson, Jobe Thompson, Joe Castle, and Greg Kiser will serve as pallbearers. "Email Address" would like to share the life celebration of Raymond "Ray" Porter. Click on the "link" to go to share a favorite memory or leave a condolence message for the family.